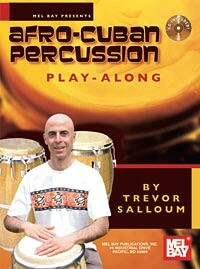 Afro-Cuban Percussion Play-Along Book/CD – This Afro-Cuban Drumming Play-Along Book with CD is a valuable recording and chart that provides a clear example of some of the most common popular and folkloric Latin percussion instruments and rhythms. These rhythms are provided in a variety of tempos to enhance your practice session. This chart/CD set was created for students, teachers and dancers of Afro-Cuban music. Each track is played for 3 minutes to allow play-along or study of the rhythms. The individual tracks can be used to learn the specific instruments being played or as an accompaniment while learning other instruments. For example, you could practice piano montunos or Latin drum set patterns to the recorded track of son clave or rumba clave to see how the groove fits with the clave. Softcover Spiral Book approx. 9″ x 12″ and 24 pages.